Plagiarism is taking someone else's work or ideas and passing it off as your own. Any time you use someones work you have to give them credit. 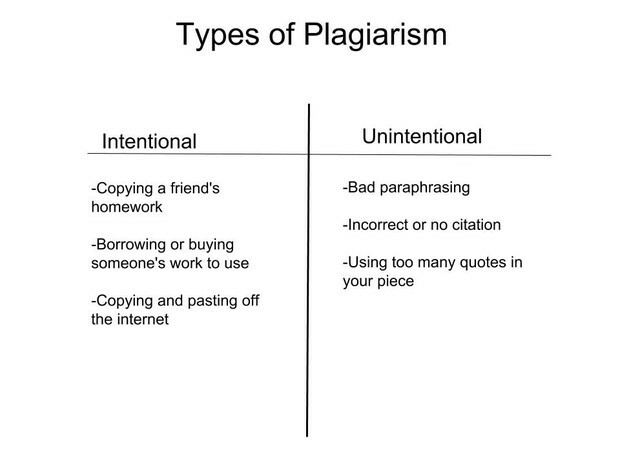 Plagiarism can include many things like, copying a friends homework, inaccurately paraphrasing or summarizing, copying and pasting a copyrighted photo, putting the authors exact words without quotations, and a lot more things. There are also major consequences of plagiarism like school suspension or expulsion and/or getting a zero on your assignment. Citing a source is kind of like giving credit to that author. When you make a citation for a webpage the format is author, web page title, web address, and copyright year. There are also many citation websites to use like the ones listed below. You can cite the source after each fact you put by adding author and page number or author and title. Also you can make something called a bibliography which is the same thing as a works cited page. A bibliography is a page of the sources you used to write your paper. When making your bibliography put it in alphabetical order by the page title, if it starts with numbers then that comes first. There is also something called an annotation and that's where you put a description of the source and how you used it in your paper, annotations go under the citation. Pictures are the same thing as an article or book. You ALWAYS cite a picture unless it's from a non-copyrighted cite. If you have to use a copyrighted photo then give the photographer credit/cite them. Here is an amazing non-copyrighted photo website. When you are searching something be sure to narrow it down as much as possible to get the best results. Also most search engines/websites have an advanced search option where you can add or cancel out information. If you can find a gear or settings button that's where the advanced search will most likely be. Try to put the least amount of things possible when you are searching but make sure it's very specific. Paraphrasing: Paraphrasing is when you use a sentence from another source and putting it into your own words. When paraphrasing be sure to only use the main ideas. EX: Heavy rain hit North Carolina due to a storm flood. Quotes: Using the exact words from the author. When you quote you have to add quotation marks around it ( " " ). Also try not to use too many quotes in your writing. Summarizing: When summarizing use only the main idea from the paragraph/article, don't use too many details. EX: The Fault in Our Stars is about teenage girl Hazel who has cancer and falls in love with her friend from therapy, Augustus Waters. With either of these methods of using information you will always have to cite.